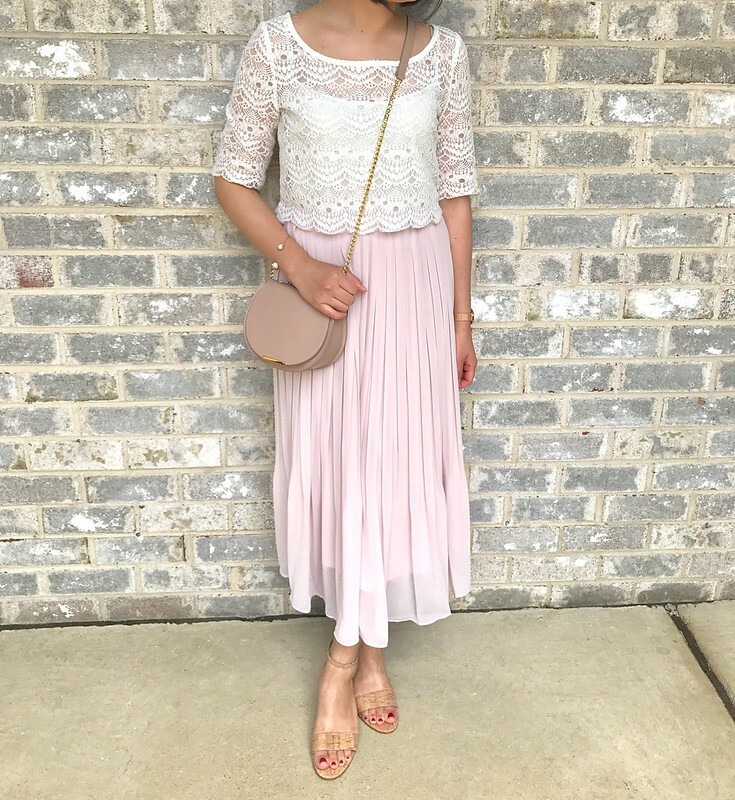 I’ve been getting a lot of wear out of this pleated skirt that I picked up at Uniqlo for only $29.90 (last seen here, review here). I was on vacation in Philly visiting my family and I wore it out twice last week. I panicked while eating dim sum when a slippery mishap splattered soy sauce all over my white top and skirt. Luckily I was able to dab off the mess before it settled into the material as stubborn stain. 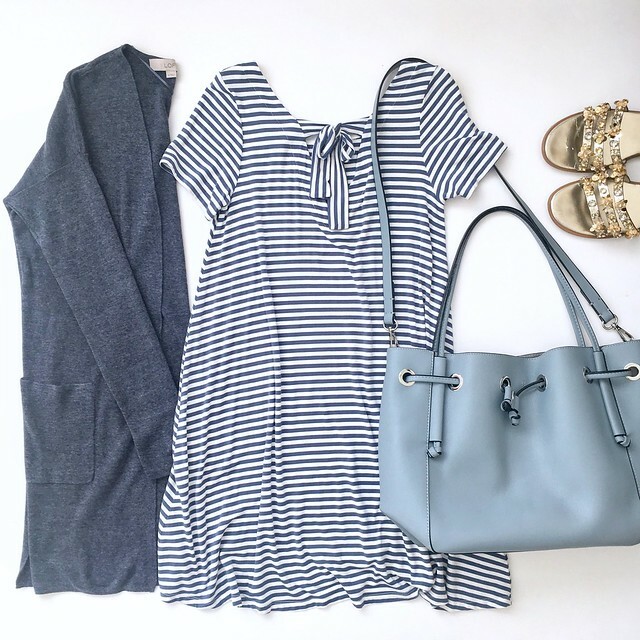 I love and would recommend these comfy low wedges from Ann Taylor (review here). Refer to this clip for another view of the outfit on me. 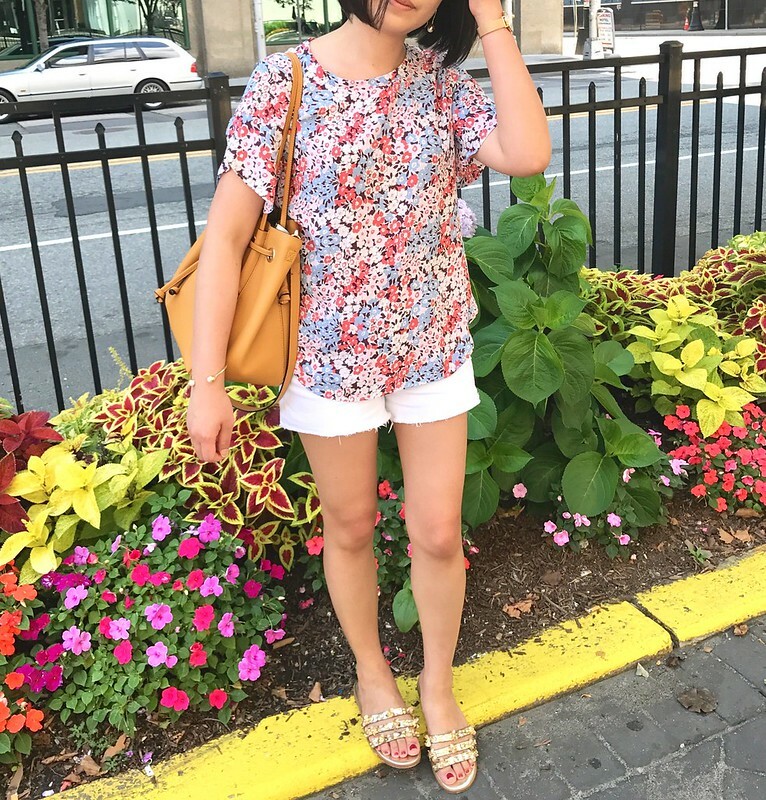 I look for tops in my closet that won’t wrinkle too much when packing so I brought along my favorite floral clean tee (review here). My favorite gold sandals are now on sale for $9.99 and they’re sold out but if you’re diligent enough sizes do pop back (I saw size 5 earlier). I want another pair as backup. Every summer I typically buy at least one new pair of sandals from Zara and wear them to death. I also found and ordered an old favorite pair of sandals on Poshmark (sign up using my referral code HPHAO to get a $5 credit) that was new and at a great price. I liked this pink long cardigan so much that I recently ordered it in blue when my size popped back in stock. Sizes are still popping up if you check back randomly. I have a lot of luck finding sizes for many “sold out” items in the early morning when I first wake up. However, I probably shouldn’t check LOFT first thing when I’m not even fully awake. FYI. 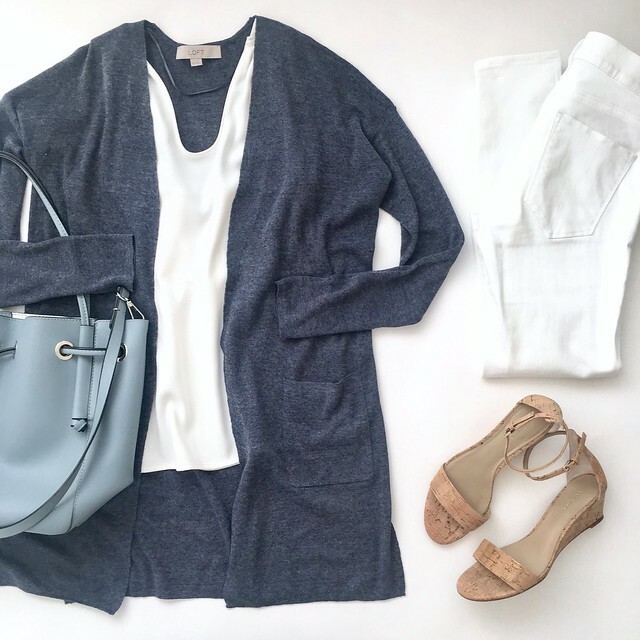 Nordstrom also carries a similar long cardigan here. I live next to J.Crew Factory but I don’t go very often because they don’t tend to fit me well and they also don’t carry petites in stores. Su @allaboutloft was asking about a few items she was eyeing so I decided to stop by to see what I could find. 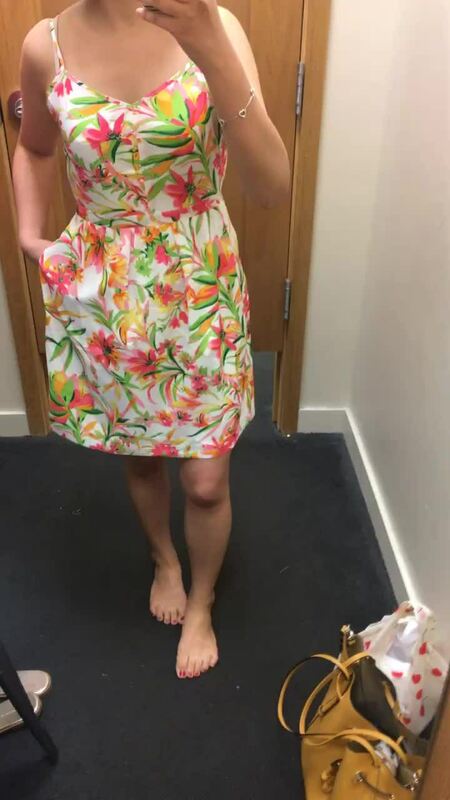 I found this cami dress and I tried on size 0 and size 2 for comparison. Size 0 (pictured above in the india blue print) fits me the best and it has a 26″ waist with an elasticized waist in the back for some give. Size 2 (pictured below in pink multi) fit me loose but it looked decent once I adjusted the straps. Click here to see what size 2 looked like when I did not adjust the straps. 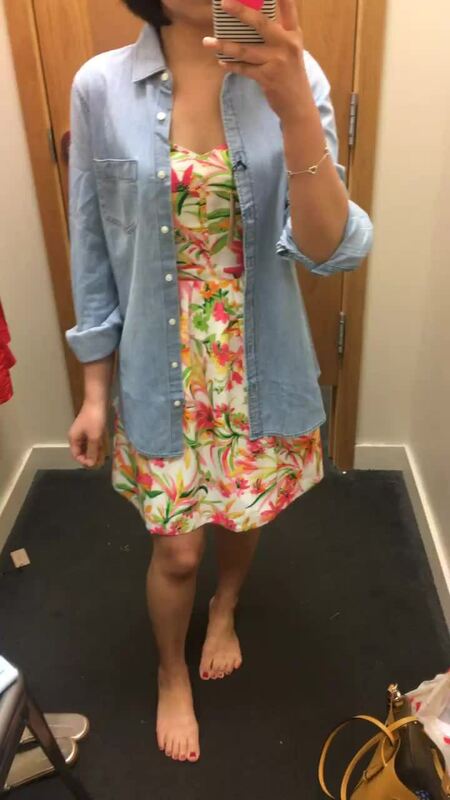 I love this chambray shirt but size XXS was too snug for me to button up so I tried on size XS which fits me better. It’s a long shirt so I would prefer it in petites for a shorter overall length. It would look cute over tops and dresses as a casual light jacket. 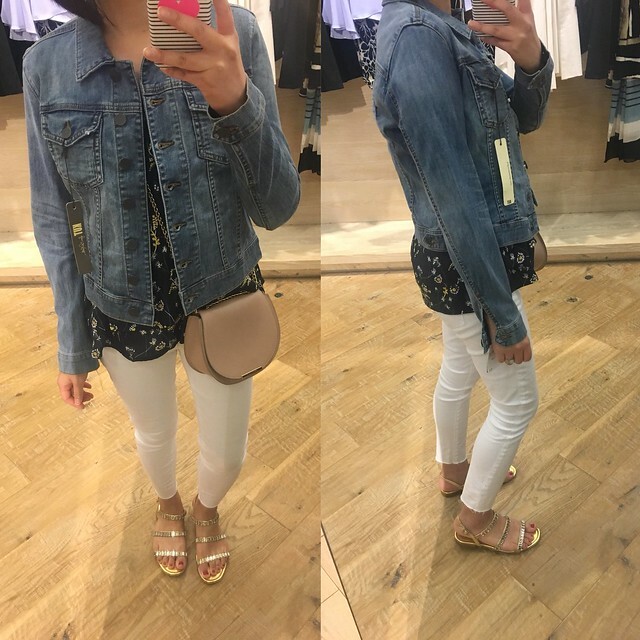 I’m always on the lookout for the perfect denim jacket and I spotted this jacket in the petites section while doing a return at Nordstrom. I ordered size XXSP after trying on size XSP in store since it felt like it ran one size larger. I received size XXSP in the mail yesterday and it fits similar to my favorite LOFT denim jacket (as seen in this post) so I can’t justify keeping it. The empathetic wash runs larger while the white version runs smaller and therefore more true to size. Size XXSP in white was very snug in the sleeves and body on me. I love the soft stretchy material they used which isn’t too thick or stiff unlike some denim jackets I’ve tried. I’ll update this post with updated video clips for size XXSP before I send them both back. Since I was already at Nordstrom to return yet another vanity sized top I popped into the Early Access section. 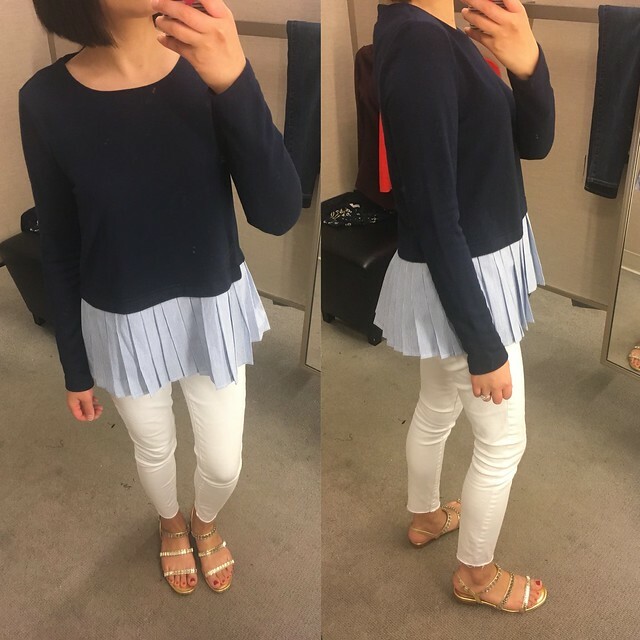 I tried on this pleated top last week which looked cuter in person. The top portion is a thicker material so it’s cozy for the fall and winter. Size XSP fits loosely so I could size down for a better fit. Refer to this clip for a better look at size XSP on me. I’ve been uploading the pictures and videos for my upcoming posts on Flickr in advance and I can see that everyone gravitates towards the video clips. I know I find them a lot more helpful than pictures and I’m happy to see that you feel the same way! I’m all about layering in the fall and winter so I look for unstructured blazers that I can wear under my coats without feeling stuffy. I was curious about this knit blazer and it runs about one size larger since size XXSP fit me well with enough room to layer comfortably. I wasn’t a fan of the collar but it could be due to the fact that I wasn’t wearing a top that goes with the color I tried on. I also tried on these J.Crew stretch toothpick jeans in size 24 and I found that they run bigger due to the stretchy material. The inseam hit at my ankles so they looked like regular length jeans on me (I’m 5′ 2.5″). The pant legs at the ankles aren’t as narrow as I prefer so I passed. Lastly, I tried on the Halogen scalloped edge sweater in red. I could only find size MP to try which fit me very loose through the sleeves and body but I loved the soft material. I hope it pops back in white so that I can order XSP or SP to try. Unfortunately, I don’t have any pictures to share for these two items since my camera roll was acting up. I’ve been trying to avoid sale but I did get lured in to ordering this Caslon swing back coat last Friday in both colors (they’re finally arriving on Monday) and these Vince Camuto Fileana booties (currently back-ordered). I’ll provide an update via my Instagram stories when I receive the jackets. The online reviews are making me nervous that they may not work out. 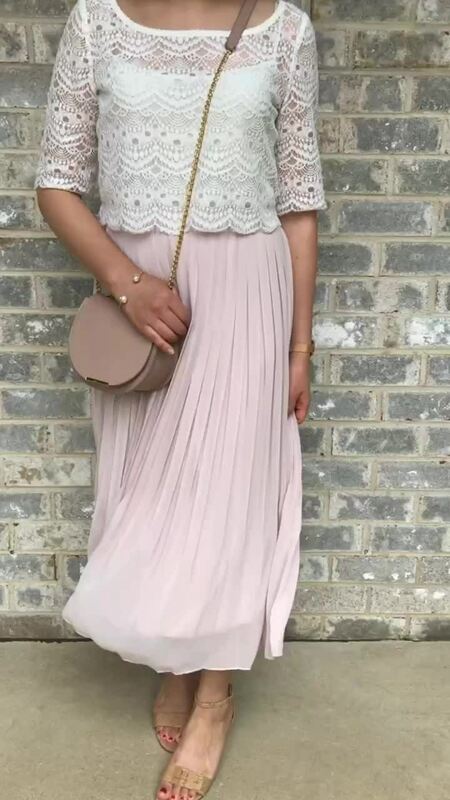 I love this eyelet lace dress but the sizing does run at least one size larger. I tried on size 00P but it’s still too loose and shapeless for my preference. Refer to this clip for another look of the dress on me. 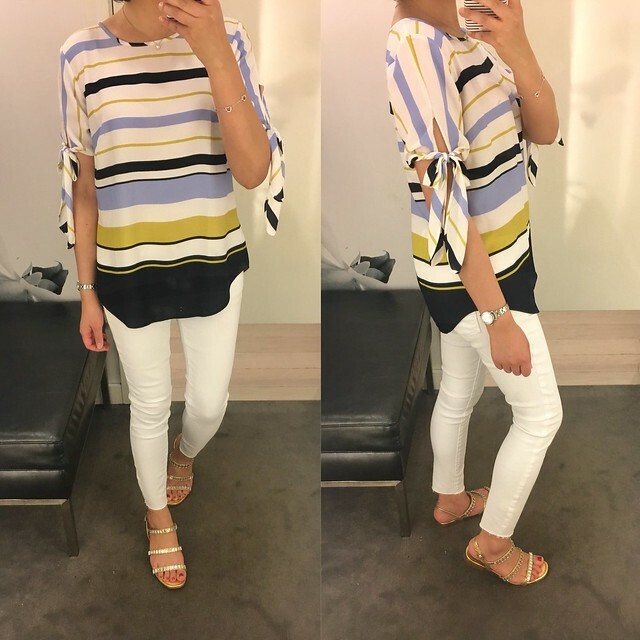 I love the tie sleeve details on this top and I ordered size XXS regular in both the stripe color above and the black color (previously reviewed here). 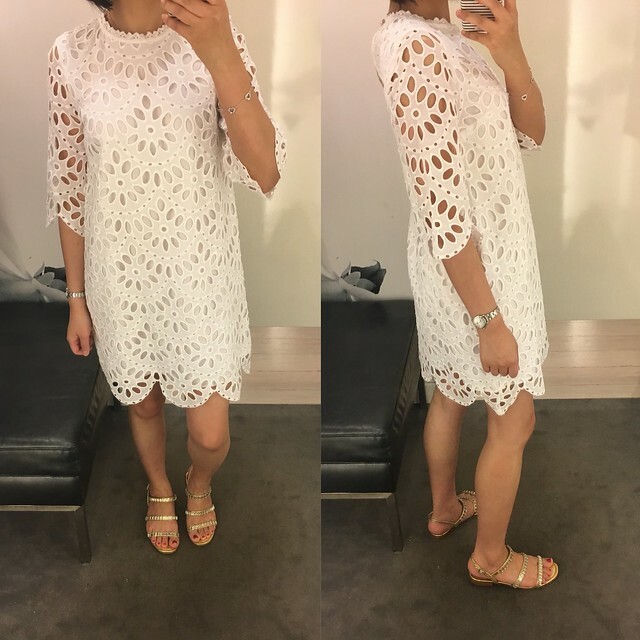 This style fits true to size and note that the all white color is sheer/see through. Refer to this video clip for another glimpse of the top on me. It’s also available in a tropical print I reviewed here. 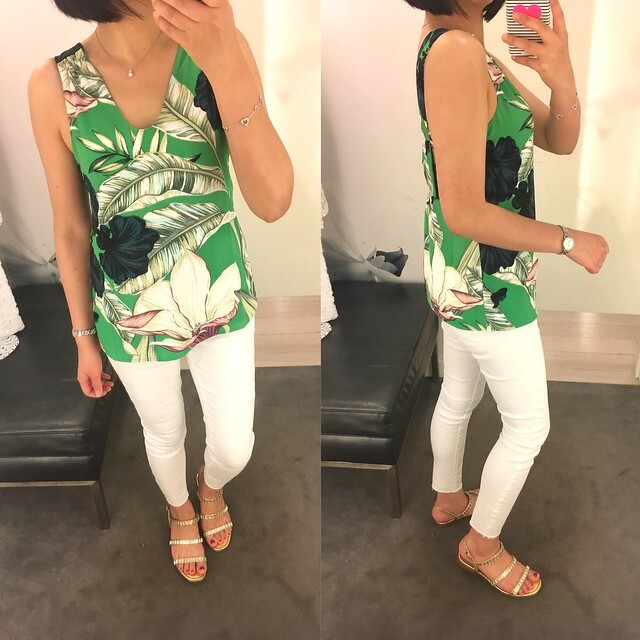 This palm leaf print is the same style as the sleeveless top (last seen here, review here) that I have in winter white. It runs one size bigger big and even size XXSP is a tad loose on me. I would suggest sizing down and trying petites if you find that the straps are too long in the regular missy sizes. 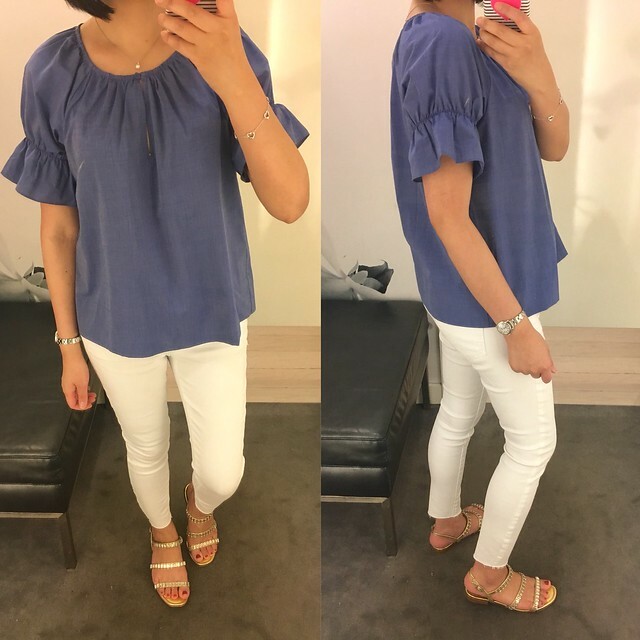 I love the crisp material they used for this top but this style runs very loose and boxy. Size XXSP felt like size SP. The keyhole opening was a bit low and showed my bra so I had to pass on this cute top. I also tried on the Gretel suede slides which actually look better on if you try them. They run half a size smaller for me so I ordered size 7.5 in the new metallic color as seen on the lovely Desiree @beautifullyseaside. I just ordered them yesterday and they was delivered this afternoon. See them on me here and refer to this clip for a close up of the shimmery gold color. LOFT – Get 40% off (50% off for cardmembers) everything. Use code SUMMER17. Valid in stores and online. My previous order for a few of the new arrivals did not work out. For example, the stripe layered double v shell was 100% viscose for the outer lining instead of 100% polyester, the neckline was really low and revealing and the fit was more generous than the floral version of the same style which I love. 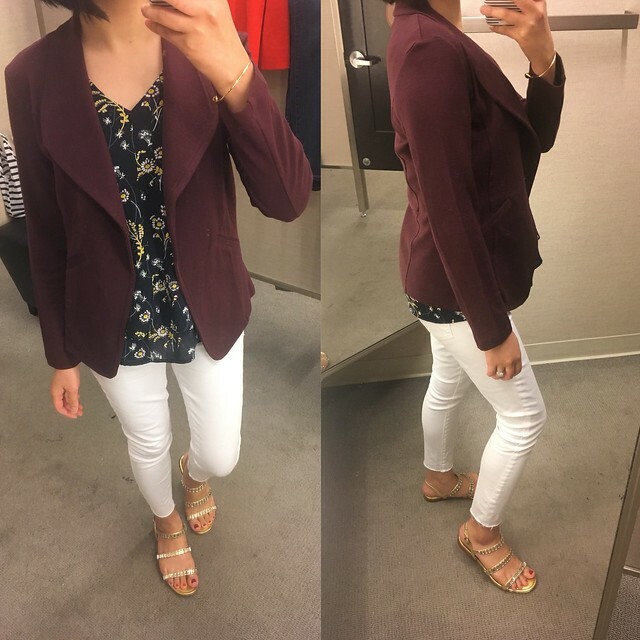 I also returned the back pleat sateen jacket (see it on me here) since the overall length is more cropped than I expected and the fit was very wide and boxy. Check out all my recent purchases here. Ann Taylor – Get 40% off (50% off for cardmembers) everything. Use code MUSTSHOP. Valid in stores and online. I placed my online order last night and due to a bug I received 40% off plus an extra 50% off for a total of 70% off retail. I couldn’t believe my eyes! 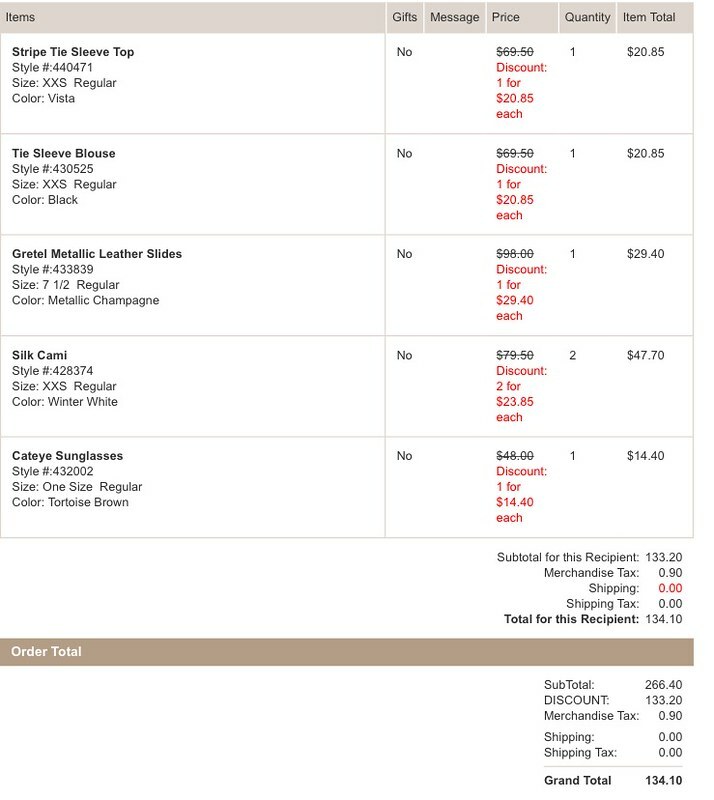 My order went through and everything shipped out today.